Early in A Quest for Life McHarg presents us with an arresting image. Describing the view from his boyhood home on the outskirts of Glasgow, he tells us that in one direction he could see the industrial miasma of smokestacks, tenements, and treeless streets, and, in another, the glories of the Scottish countryside. "I was born and bred," he writes, "on a fulcrum with two poles, city and countryside." Confronted with such a stark contrast, the man who was to become "the founder of ecological planning" began at an early age to turn literally from inhumane urban development and toward the beauty and power of Nature. Each chapter of this book illuminates key stages in McHarg's life and in the evolution of his environmental awareness. We see him as a youth standing on a hillside beside the impressive Donald Wintersgill who, with the wave of his cane, lays out an entire village complete with lakes and forests, and thus introduces the astonished McHarg to the profession of landscape architecture. In some of the bloodiest battles of the Second World War he witnesses the magnitude of human destructive capability. Later, when he faces a crisis of conscience over his religious training and its exhortation to gain dominion over life and subdue the earth, he begins to develop a deep spiritual appreciation for the sanctity of Nature itself. His training as a designer and planner in the Modernist Bauhaus tradition, with its neglect of the environment; his bouts with tuberculosis that showed him the link between public health and city planning; his famous "Man—The Planetary Disease" speech before powerful industrialists—all stand as emblematic of battles that are still being fought today. 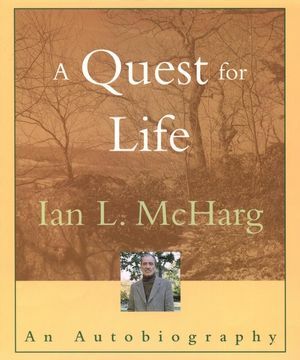 A Quest for Life also chronicles the many triumphs in McHarg's career. It offers fresh insight into the revolutionary design method behind his groundbreaking book, Design with Nature, and explores the development of geographical information systems. We learn firsthand about his work on the celebrated regional plans for Denver and the Twin Cities, as well as the Woodlands new town project. His most enduring contribution, however, may prove to be his four decades of teaching at the University of Pennsylvania. Through the generations of landscape architects, designers, and planners he taught there, his influence has spread around the world and into the future. A Poem to the World's Children. Bibliography and Inventory of Projects.